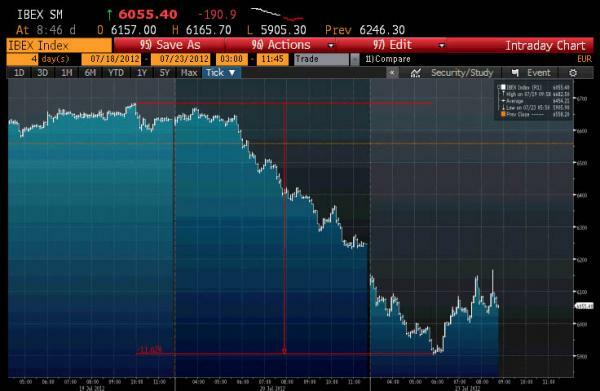 A few hours ago, the IBEX hit a level of 5905, the lowest since April 2003. The irony is that as recently as weeks ago, various momentum chasing self-professed stock “experts” saw some technical formation or another, making them believe that the bottom is finally in for the IBEX, which is “fixed.” Turns out it wasn’t; it also turns out the market was completely wrong and the result is a 12% slide in the Spanish stock market in two days as reality’s return is fast and furious. If this happened in the US, it would be the equivalent of 1500 DJIA point collapse in 48 hours, and unleash mass panic and civil disobedience as people realized their 201(k) is really a +/- 001(k).